Riga French Lycée was founded on September 21, 1921 at the request of the French government. Its founder and first principal was Marcel Etienne Segrest. Historically, it was located at 29, Elizabetes Street. In 1923 the School Council approved the motto of the lycée “For fatherland’s honour, vigour and beauty’. From the very first day of its existence, the lycée was regarded as an educational establishment which provides excellent education due to its creative atmosphere, discipline, high demands, professionalism and responsibility of the staff. Guest lecturers from France have always worked here side by side with prominent native teachers. Due to energetic activities of the long-term principal Augusts Leimanis, a new lycée building was built at 48, Valdemāra Street (the present Faculty of Chemistry of Latvia University). In the Soviet occupation time, Riga French Lycée was re-named into Henri Barbusse Riga Secondary School Nr 11. From 1965 it was located at 8, Mēness Street. The lycée re-gained its historical name in June, 1990. In 1968, during the Second Latvian Song Festival, Juris Leimanis, a nephew of the first principal Augusts Leimanis, became the Chairman of Riga French Lycée. Under his guidance two volumes of articles about French Lycée were collected within the period of twenty years. In September 1991 the grant of Leimanis was established. Every year it is awarded to the best student of form 12. The grant winners are: Modris Lācis, Dace Stiebriņa, Alise Balode, Laura Rozenberga, Ieva Freija, Līga Ābele, Stella Ankrava, Ilze Kreituse, Andra Liepiņa, Indriķis Sīpols, Una Bergmane, Andris Pirtnieks, Austra Dreiblate, Elīna Brasliņa, Liena Līksnīte, Jānis Šmits, Toms Rekšņa, Edgars Feldmanis. R.Schuman centre (a library) was created in cooperation with the French Institute in Latvia. Every year different activities during the Francophonie week as well as the professional development courses for the French language teachers take place in the lycée. Riga French Lycée has sustainable learning traditions. More than once the lycée has won the third place in the Friendly Appeal Award in the grammar school group. In 2012 the school was accredited for six years. The lycée celebrated its 90th anniversary in September 2011. The culmination of the celebration was the concert in the Daile theatre and the graduate get-together party. The 95th anniversary concert of the Lycée was held in September, 2016 in culture palace “Ziemeļblāzma”. The concert brought premiere of the song “Manai Latvijai” (“To My Latvia”) dedicated to the Lycée by Jēkabs Jančevskis with Pēteris Brūver’s lyrics. On September 3, 2018 Riga French Lycée returned to its historical building at 48, Valdemāra Street, where new facilities for Form 7-12 students are provided. Nils Ušakovs, the Chairman of Riga City Council, in the opening event of the building wished that every school in Latvia were as modern, as open to European values and as rich in traditions as Riga French Lycée. Nonetheless, there is a meaningful fact known that a stone from a very ancient building in France (located in the crossing point of Centre, Val-de-Reuil, Burgundy and Auvergne regions) has been built into the wall of the Lycée. This fact symbolically accentuates the close relationship between France and Latvia. At 48 K.Valdemāra Street the total are of 5355 square meters of the historical building has been renovated. There are 31 classrooms, a cloakroom for 600 students, a canteen with 274 places, an assembly hall with 209 seats, a conference hall and separate premises for sport lessons and for the administration of the school. The renovation of Riga French Lycée has been co-financed by European Regional Development Fund (ERDF). The building has been renovated by general partnership „RERE Būve 1” by the order of the Riga City Council’s Property Department. Since 2016, the Riga French Lycée in cooperation with the European Parliament Information Office (EPIO) in Latvia participates in the “European Parliament Ambassador School” programme. The aim is to promote Form 9–12 students’ awareness of being an important part of the European Union; to create understanding of social environment and to motivate students to participate by learning to hear other opinions and debate, as well as to tell objective arguments from emotional ones and make objective decisions. Within the framework of the project, in November, 2017, the Riga French Lycée students and teachers had the opportunity to visit European institutions in Brussels and to participate in student hearing in the European Parliament. Together with young people from France and Belgium, the Lycée students had prepared proposals to reduce uneployment and ideas for creating new businesses. The students debated in work groups and met the Member of the European Parliament (MEP) Krišjānis Kariņš. Whereas, together with teachers from other EU countries, the Lycée teacher Liene Apine-Birkmane took part in teacher seminar in the European Parliament where the material prepared by the lycéens was well-regarded. The aim of the seminar was to gain experience in methodical work and preparing lessons on the European Parliament. This school year, the goal of the “European Parliament Ambassador School” is to understand the reasons why young people from Europe are not keen on participating in the MEP elections. During classes of French, the Form 11A Lycée students who participate in the project developed a questionnaire to find out the students’ awareness and knowledge on young people’s possibilities in the European Union. Their consultant is Inese Vaidere – the Latvian Member of the European Parliament. As part of the national holiday, on 17 November, 2017, Inese Vaidere visited the Lycée to inform the students of Forms 11 and 12 about representing the interests of Latvia in European institutions and other topicalities. During the meeting, the participants also viewed and discussed the material summarised by Form 11 students on the knowledge of the lycéens about the EU and Latvian Members’ of the Parliament role in the law making process. The Form 11 students continue to cooperate with Inese Vaidere in the project “Open Book”. The idea of the project is to send in specific questions and proposals to the office of the MEP, so that next year those could be discussed in the Youth Forum in Brussels. The Form 11A students continue to work in the ambassador school programme. On 9 February of this year, in EPIO, the Form 11A students had a meeting with the MEP Artis Pabriks, as well as took part in a discussion with the director and philosopher Krista Burāne about “Civic Participation”. The next stage of the programme is to organise the Europe Day at the Lycée in May, 2018. – Since the school year 2012/2013, financial support from the Embassy of France ensures bilingual studies of political sciences, philosophy and economics in secondary school classes. The aim of the bilingual project is to integrate the French language in various subjects, thus “bringing to life” its use and allowing students to try out their language skills. Every year at the Lycée, lessons are delivered by some volunteer – a lecturer sponsored by the Ministry of Foreign and European Affairs of France. Until now, the teachers selected by the French Institute covered general French lessons, but since September, 2017, the lecturer is teaching social sciences, economics and political sciences in French to Form 9–12 students. 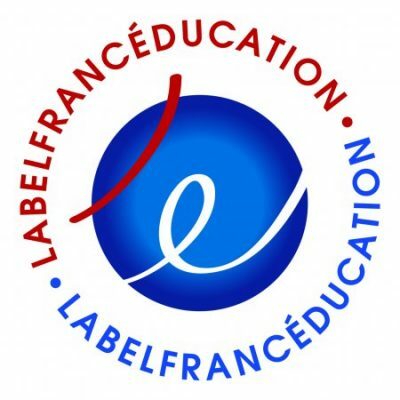 – With support from the Embassy of France, the Riga French Lycée has received the international quality sign “LabelFrancÉducation” for achievements in teaching French and promoting the French culture. The quality sign is awarded by the representatives of Ministries of Foreign Affairs and International Development; National Education, Higher Education and Research; as well as of the agency AEFE, French Institute and „Mission laïque française”. Only 91 school around the world has received this brand of recognition, but the Riga French Lycée is the only school in the Baltic States that has been estimated in such a way. – For almost 20 years now, the Lycée welcomes from all over Latvia the participants of the annual French teachers’ seminar organised by the Embassy of France and French Institute. The aim of the seminars is to provide support to continuing education of teachers and especially to new teachers’ professional development. The seminars are delivered by experts sponsored by the Embassy of France, who organise master classes in teaching French as a foreign language and introduce latest teaching methods to the participants. As part of the seminar of 2017, the international social network of French teachers “IF Profs Lettonie” was presented to the teachers of the Lycée. – French teachers working in the Riga French Lycée and other institutions of Latvia are also offered French government scholarships for pedagogy continuing education courses or language practice in France. – French Institute in Latvia supports learning French by regularly organising visits of French writers or other specialists to the Lycée and their meetings with the students. Active cooperation takes place within the framework of Francophonie Days: Riga is visited by various guest artists; students participate in poetry reading and francophone song contests; a press conference is held with the participation of the ambassador and representatives of the Ministry of Foreign Affairs. – A recent event in the cooperation between the French Lycée and French Institute is a signed agreement on the use of the digital database “Culturthèque”. The database is in French and can be used for free among the students and teachers of the Lycée. It is also planned that the Lycée students will have a free access to the multimedia library of the French Institute, the materials of which are supposed to be introduced to Form 9 students by a guest lecturer from France in March, 2018. An important part of the Lycée life are various international projects that allow to gain new knowledge and practice what has been learned. Particularly important are bilateral contacts. For many years the students and teachers have been participating in the European programme “Comenius” projects, as well as cooperating with different schools in France. Since 2014, the Lycée has been cooperating with Saran middle school Montjoie in Orléans (College Montjoie de Saran). The most positive aspect of the programme is the Skype correspondence and conversations in French, that take place all around the school year between Latvian and French students. The students get to know each other remotely through letters, but at the beginning of the school year, they travel to France to meet one another in Saran. The Lycée students spend a week living in French families, attending school lessons and taking interesting excursions, for example, to Loire valley and castles, to Paris. Afterwards, for the rest of the school year, the students have Skype correspondence and talks. At the end of the school year, French students visit Latvia. In the spring of 2016, Form 7–9 students welcomed 22 students from Orléans in their families. The French students were accompanied by the school director Mr. Dorval and teachers. The guests took part in foreign language learning lessons, visited the Old Town of Riga and engaged in sports activities in Mežaparks track, as well as joined together in a concert. Every year, the exchange programme focuses on a specific theme. First 2 years, those were music projects, but in school year 2016/2017, the project turned to sports. When French students and teachers visited Riga again in the autumn of 2017, they were welcomed by families of those children who visited France in April as part of the exchange programme. This time, the guests not only attended lessons, but also participated in Lycée Sports Day that was held on the new stadium on Kr.Barona Street, as well as joined in an orientation game through most significant places of Riga. In February 2018, the Lycée students have received letters from the new participants of the project and start to get to know each other by exchanging messages, so that next school year, in September 2018, they could go to France, and in April, 2019, they could welcome their French peers in Latvia. Students from Saran are very interested in seeing the new Lycée and want to know about preparation works for the Latvia’s centenary celebration. The new project is intended to have a musical theme: songs in French, Latvian and English will be learned together. Students and teachers from Saran are very interested in this cooperation. They have created a special booth about Latvia in their school and discuss Latvia in their lessons. In January of this year, several French student classes had an interesting event – an afternoon devoted to Latvia, Riga and Riga French Lycée, during which the students communicated via Skype with Riga where Form 9B student Nikolīna Rūtenberga was telling them about the Lycée and answering their questions. The cooperation and student exchange project allows to gain valuable experience in learning both the language and another culture.